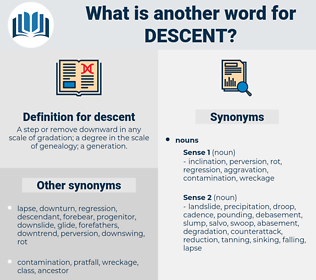 What is another word for descent? 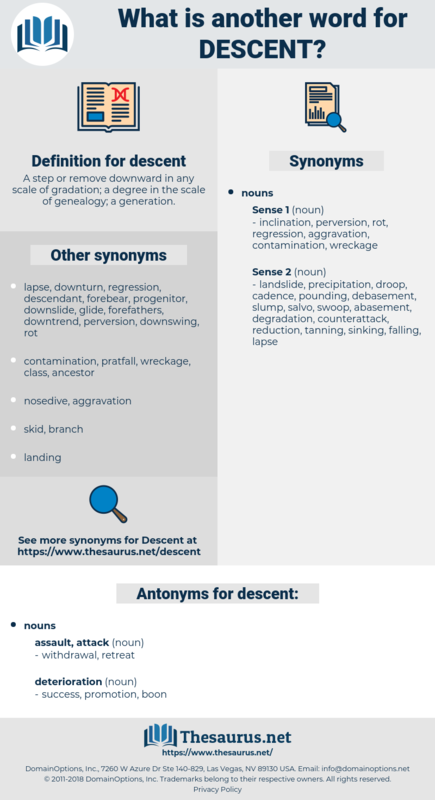 dive, filiation, descending, pedigree, descend, decline, raid. descendant, lineage, descendent, offspring, progeny, origin, affiliation, Alighting, ethnicity, strain, ascendancy, seed, decrease. evenness, level, elevation, ascent, rise, ascension, upgrade, increase, improvement. invigoration, comeback, rejuvenation, headway, aggrandizement, uprise, resistance, pitch, soaring, revitalization, flourishing, blossoming, recuperation, defensive, guard, opposition, uphill, lean, heir, exaltation, increment, shelter, inheritor, child, flower, accrual, addition, offspring, recovery, prime, snapback, tilt, issue, augmentation, accretion, rehabilitation, gain, flowering, hill, rally, renewal, Rejuvenescence, addendum, defense, Glacis, shield, upswing, betterment, up, son, seed, protection, heightening, restoration, successor, rake, upturn, strengthening, progeny, security, posterity, heyday, boost, supplement. Frank was not wrong when he placed him as an American, though of German descent. 10. The Descent of the Holy Ghost. discant, disjoined, decimate, discussant, disunited, descend, disunite, Desmond Tutu, discommode, dissonant, dignity, deckhand, dig into, disjoint, decant, duty assignment, disseminate, desmid, Deoxygenate, Dika Nut, dismayed, Docent, desquamate, dachshund, disunity, dehiscent, document, disownment, documented, dockhand, designate, Djanet, doughnut, dismount, discount, descant, disjointed, detachment, dissonate, disowned, designed, dessent, dissent, decent, desiccant, designated. rappel, nose dive, dive, swoop, crash dive, jump, nosedive, abseil, collapse, flop, drop, parachuting. lightening, fall, slide, set, drop, sinking, shower, cascade.